Giovanni Tria is a London-based composer and producer specialised in music production and sound design for media. Despite being passionate about music since his earliest years, Giovanni started effectively producing music at the age of 18. He taught himself composition "the way it felt right", whilst his great passion for films contributed to make his music become more and more instrumental and descriptive. 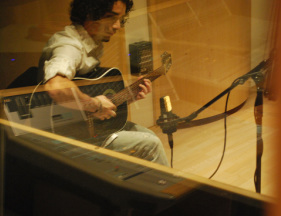 Giovanni obtained a place at Leeds College Of Music in 2008 and during his stay in Leeds he met many musicians with whom he collaborated on diverse interesting projects. At college Giovanni focused his energies on the understanding of music applied to images, especially in films and television. He also undertook additional studies in music for new media, such as video games and Internet content.. In 2011 Giovanni moved to London, from where he has collaborated with great film producers, journalists, talented theatre directors and top music production labels, who showed great appreciation of his music, which is said to feel "spontaneous, reflective and coming from the heart". Giovanni's compositions cover diverse styles and they have accompanied projects such as films, documentaries, trailers, adverts, plays and promotional videos. Giovanni also writes library music and due to this, his compositions can be regularly heard in various programs, adverts and TV shows on major national and international TV channels. Among the Production Music Houses he works with, there are EMI Production Music, Universal Production Music, SATV Music, Gothic Instruments, BMG Production Musics and the Zodiac Media Group. Human Stories and Positivity and Beauty are two of the most special projects Giovanni had the pleasure to work for. These are multi-composer albums created for KPM Music (EMI Production Music) and produced in Abbey Road Studios, in London. With regards to films, worth noting is the collaboration with the film director Aram Vidal, with whom Giovanni has worked on three films (Relevo, Gato and The Blue Fish). With regards to theatre work, The Little Pony, a Spanish play at Cervantes Theatre in London, has been the most recent production Giovanni produced the music and sound effects for. Giovanni’s portfolio also includes other areas of the audio production, such as the sound design and audio editing. Initially these tasks mainly consisted editing dialogues, foley/background sounds production and film sound design. Most recently Giovanni has worked on a variety of sound design/SFX projects for trailers as well as on major audio editing jobs for sample libraries and virtual instruments. Among the most recent projects there are some great trailer SFX releases for Gothic Storm and several modules for Dronar, a virtual instrument by Gothic Instruments.